Jamie Green, a security guard at Felix Varela High in West Kendall, is accused of dealing drugs during school hours. 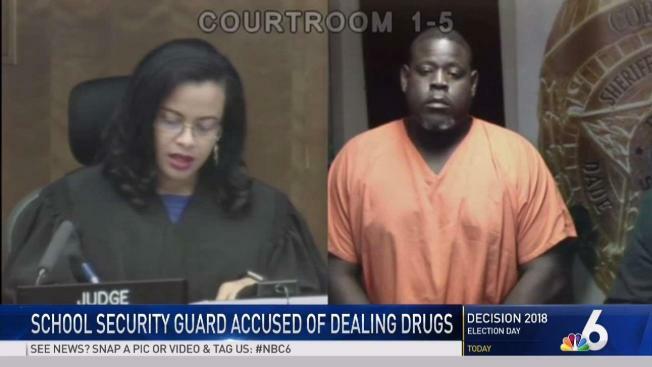 A Miami-Dade County Public Schools security guard was arrested Monday for allegedly dealing drugs. According to police, Jamie Green, 43, is being charged with cocaine trafficking, possession of cocaine with intent to sell, possession of cocaine, and other drug related charges. Investigators said they found over a pound of pot inside of Green’s home. They also found a Ziploc bag containing cocaine, cash, and small bags often used to sell and distribute cocaine. According to Miami-Dade County Public Schools, Green was a security guard at Felix Varela High School in Southwest Miami-Dade. “Miami-Dade County Public Schools expects all employees to exhibit the highest level of professional and personal comportment, whether they are in or out of the school environment. Actions by employees who demonstrate a lack of good moral character will be handled swiftly. As such, the District is moving to immediately terminate his employment,” said a representative of Miami-Dade County Public Schools. Green was arrested and taken to jail.